Some motors of that era still had starting handles which, in the case of a flat battery, you placed in a slot on the centre at the front, wound it up and hoped the engine would spring into life. For the Ministry of Transport and Civil Aviation driving test hand signals were obligatory and the rule was you had to twirl your right arm if turning left. Malcolm Ginsberg reports on a fine family car that keeps most things simple, except for the official name. Peugeot 3008 SUV 1. BlueHDi 130 StopStart EU6 Allure. This means it is a front wheel drive diesel. There are 180 and petrol versions available. Yes there are an amazing list of inclusive extras, if you know what I mean, and to the test car one could add items such as keyless entry, electric tailgate (which includes foot control), and a Smartphone charging plate. Do not bother with the upgraded Focal premium HiFi speaker system perfect for hands free telephone conversations. The Allure standard kit is very good including sat nav and a rear view camera. 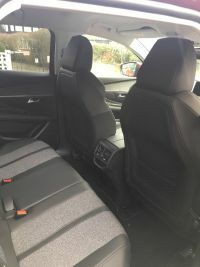 Added to the press car was advanced grip control, heated front seats (£850 and lovely) and full LED lighting offering an enhanced view at night (£850). Metallic paint is a personal choice (£525). The on the road listed cost was £29,605. These are tough times for car dealers and very attractive prices can be negotiated. Four-wheel drive is not available on the 3008 to keep the prices and complexity down. Peugeot developed the grip control system that can do most of the things 4WD can do, aside from the most extreme off-roading. Where fitted, it adds a rotary controller to the centre console that allows you to select the driving mode suitable for the terrain, whether it is snow, gravel, mud or tarmac. For peace of mind it needs justifying for normal suburban motoring. The latest Peugeot 3008 offers a spacious, upmarket cabin and in Allure spec most of the day-to-day requirements in modern motoring. 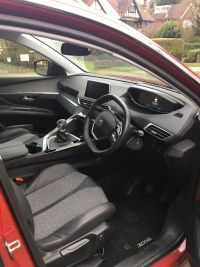 As I have said before in a week’s loan it is not always possible to learn one’s way around the cockpit but with the 3008 the obvious difference to most is a steering wheel squared off at the top (now standard on most Peugeot models) that is simply brilliant to use and hopefully will be copied by other manufacturers. The 3008 is not nimble but feels like it is. Sitting higher up than with common saloons one does feel like the king of the road, at half Land Rover prices. It is also practical and pleasant to drive, even if on paper the 0-60 time is just over ten seconds. Forget about Peugeot’s claim of 60mpg and knock 10mpg off the diesel fuel consumption. The 120mph top speed is academic and she rides nicely at the legal limit or perhaps a little more if you are not bothered about the urban myth concerning the new Smart motorways. Highways England could spend their money much better sorting the lights out on the bottom section of the M1. The 3008 is comfortable, with a well-judged ride that is firm enough to stop it feeling bouncy, but with 18in wheels soft enough to glide over bumps in the road. 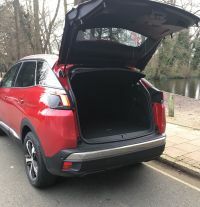 There is plenty of space inside for five (if you want more room and seven seats, you will have to go for the larger 5008) while the engine range is a decent mix of efficiency and performance. The 508 saloon version of the larger car featured in our October Road Test. 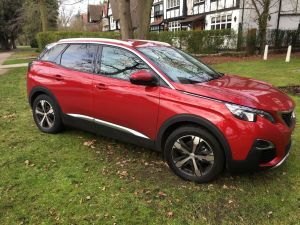 For many, the Peugeot 3008 will offer everything they need: it is economical, practical and upmarket, all at a reasonable price. If you are after a small SUV or crossover, the 3008 should definitely be one to consider. Chief rivals are the Kia Sportage, Nissan Qashqai and Skoda Karoq with road tests to follow in coming months. There is also the sporty handling Mazda CX-5, plus practical rivals such as the Ford Kuga, Renault Kadjar, Hyundai Tucson, Honda CR-V and Toyota RAV4. A mind-boggling choice. Where the 3008 excels is with its comfort and practicality. The cabin is plush and Peugeot is to be complimented on the current interior finish.